Overview: Calc, graphs and tables. Complex numbers, polynomials, derivatives. Calc, graphs and tables. Complex numbers, polynomials, derivatives. Advanced scientific, graphing and algebra calculator, polynomial equation solving. Shows results as you type. Use menu to switch between modes. REQUIRES INTERNET CONNECTION, CONTAINS ADS! PLEASE DO NOT INSTALL, IF YOU DO NOT AGREE WITH THE TERMS. Visit Developer Website for help and ask questions: http://www.facebook.com/mathlabcalc. 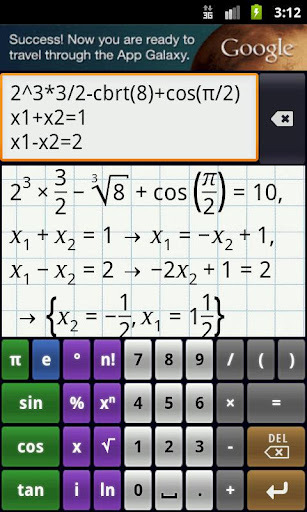 1 Komentar untuk "Mathlab Graphing Calculator v1.2.32 Apk"